On 17th July 1969, Astronaut Neil Armstrong was preparing to walk on the lunar surface. Forty years later, on 17th July 2009, Hyundai Motor Company Australia (HMCA) announced that their range of vans and shuttle vehicles, the iLOAD and the iMAX, had gained a 4 star ANCAP ratings. The ANCAP 4 star rating is applicable to vehicles manufactured from March, 2009. The testing was carried out in South Korea under supervision from ANCAP and also EuroNCAP. Only two other vans sold in Australia, Mercedes Benz Vito and Volkswagen Transporter can match the achievements of Hyundai. 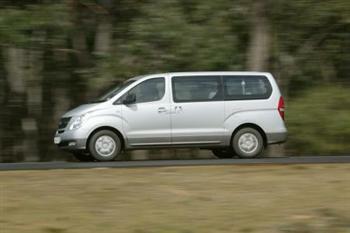 No vans have a higher rating, with all others sold in Australia being lower. 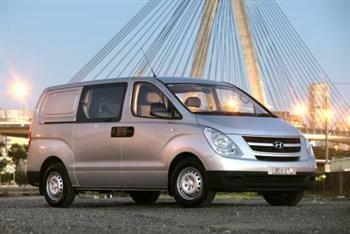 Hyundai launched its iLOAD and iMAX vans and shuttle vehicles in February, 2008 and since then have enjoyed a sales growth in both sectors of the market. Both vehicles share the same platform and use the same engines with gearbox combinations. Although having said that, the iMax is not available as a petrol powered manual and the iLoad is not available as a petrol powered automatic. ^Note: Manufacturer's List Price (inclusive of GST, excludes dealer delivery and statutory charges). *Source: ADR 81/02 static laboratory combined average city & highway cycle test. Fuel consumption will vary depending on a combination of driving habits and the condition of the vehicle. The vehicles include a lot of common features such as auxiliary input for both MP3 and iPod players, sliding doors on both sides, height adjustable seats and seat belts, keyless entry, alarm and front airbags. ABS and EBD in conjunction with disc brakes all round are also standard on both models as is a tilt steering column. There are also accessories common to both vehicles which include a bluetooth phone kit, tailored carpet or rubber floor mats, alloy nudge bar, roof racks and front/rear park assist. All genuine Hyundai accessories are covered by Hyundai’s 5 year Accessory warranty with unlimited kilometres, as are the vehicles. Mechanical specifications for the front suspension and braking systems are mostly similar, if not the same. However, it is the rear suspension where the platforms differ. The iMax has a coil spring set-up to give the rear most passengers a comfortable ride whilst the iLoad has a leaf spring rear-end to handle heavier loads. In fact, should the optional barn style doors be selected 2 pallets can be loaded, by fork lift, one through either side door and one by the rear doors. The load capacity, depending on the model, has a very handy range between 1,059 - 1,076 kg. Eight colours are available for the iLoad and 4 for the iMax. During a very short drive in an iLoad it was obvious that HMCA has produced a very worthy van. With a 4 star safety rating and a car like ride it was indeed a very satisfying drive. The iLoad van handled the suburban roads and traffic conditions with aplomb.